Lesley Marden is a regular everyday wife and mother who recognized at an early age that she was aware of things that other people couldn’t see. After being laughed at and told that she was lying about her encounters, Lesley decided to keep her experiences to herself and even tried to stifle them all together. It wasn’t until she was in her twenties that she decided it was okay to be different, and allowed herself to start experiencing what came naturally once again. She had always compartmentalized her existence by keeping the different parts of her life in neat little boxes. One box contained family, one housed friends, the next box was for work and the final box held her paranormal experiences. All boxes were tightly closed, as only one box was allowed to be opened at a time. Somehow, the top on the last box had been left open of the contents of that box have slowly made their way into all of the other areas of Lesley’s life. It didn’t seem like it at first, but this, as everything does, happened for a reason. Because of this leaking box, Lesley has embraced and developed what gifts she has been given and is now using what she has to help others. 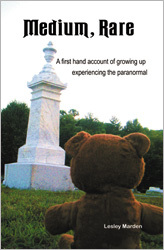 Lesley is the author of the book Medium, Rare: A First Hand Account of Growing Up Experiencing the Paranormal. She is also a certified Level III Reiki Master Teacher and has worked as a medium on public and private investigations. And, she creates spiritually energizing and uplifting products — candles and more — at Positively Brilliant. Although she has done psychic readings in the past, her focus is now on growing spiritually. Recently she has been helping others to realize that we are all supported by the spirit world every day and that it is okay to just be who you are. Lesley lives with her family in the beautiful Lakes Region of New Hampshire. She loves photographing landscapes, but has captured a few intriguing paranormal images as well.